Just another day at he office. 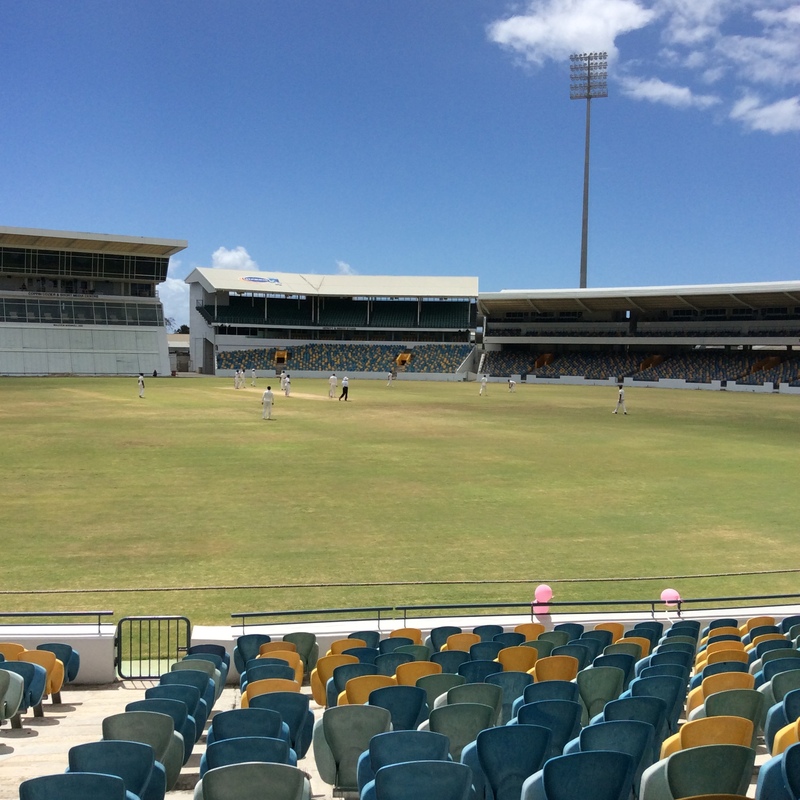 Sun, sea, food, drink with some cricket thrown in for good measure. It was a subdued breakfast time this morning with bodies surfacing late. It is very tiring all this relaxation lark so please pray for us that we can survive this torment everyday. Okay some of it is self inflicted I will agree, such as the late night gatherings around the bar talking about everything and nothing really. Several younger tourists did not arrive back from Harbour Lights until the wee hours, which explains their lateness on parade. Two people did not show at all this morning and we had our first ‘missing in action for a day’ casualty. The individual did appear very briefly it must be said only to retire injured in no time at all. 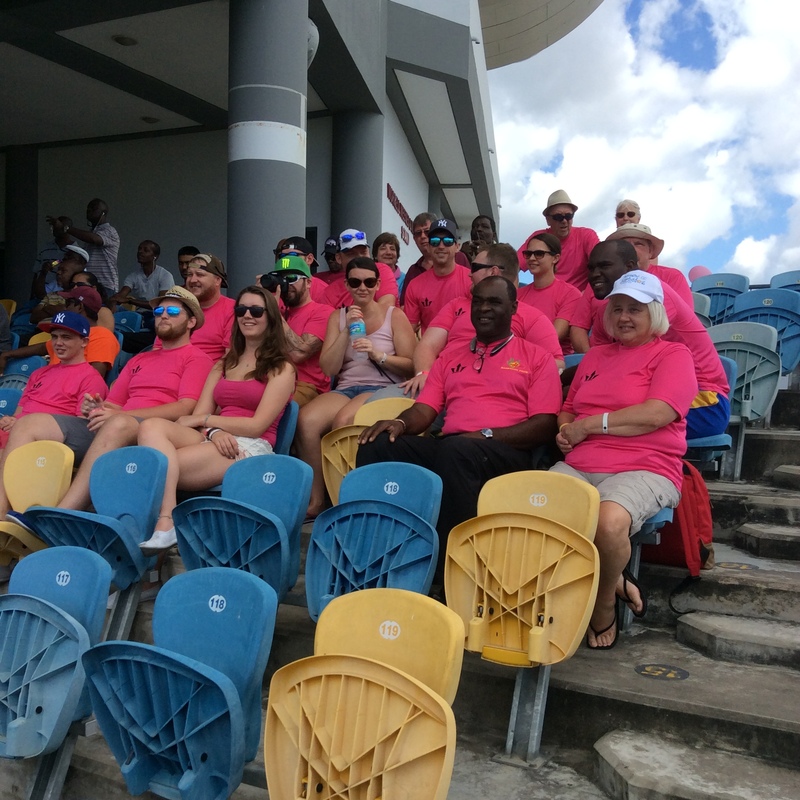 A group of about 20 ventured to the 2nd day of the match at The Kensington Oval between Barbados Pride and Guyana Jaguars. Arrangements were made the day before to purchase some ‘special’ pink tee shirts from one of the players. Saturday was a special Breast Cancer awareness day and the expectation was for everyone to wear pink. The shirts were designed and created for the players and management and let’s just say they fitted better on young athletic, toned bodies rather than older, more ample forms of the human figure. In fairness the majority of our little group fell into the first category. We made quite an entrance arriving an hour after start of play as this group of people all dressed in shocking pink marched into the seating area and took their places. We attracted a couple of photographers from various publications. Wendell Coppin the Barbados manager came over to thank us personally for supporting their adopted charitable cause. The evening was once again a subdued affair as the stresses and strains were taking their toll. The second of the cricket matches tomorrow at Isolation Cavaliers so an earlyish night maybe not a bad thing.